As one of the most famous literary addresses of all time, 221B Baker Street conjures up images of London’s smog-filled streets, horse-drawn carriages, smoking pipes and even smoking guns. This is the realm of murder most foul and arguably the best detective of all time is on hand to solve the case. Merkur has indubitably delivered a thrilling slot machine game to entertain and enthrall. No newcomer to the world of gaming, this developer can boast over 50 years’ experience and 150 titles to its name. Immerse yourself if you dare in the sinister world of Sherlock Holmes, his faithful companion Dr Watson and his arch enemy Professor Moriarty. The game’s afoot! Read our full review below. 221B Baker Street by Merkur is played over five reels and three rows. There are a maximum 20 paylines which can be applied from 1 - 20 in multiples of five. The minimum betting stake per line is £0.01, the maximum is set at £40.00. For fans of the books, many of the symbols will appear familiar; the chillum, a handgun, a glass of wine and a pack of cards, all offer the lower payouts. Landing Sherlock himself, or either Dr Watson or Moriarty, is more significant and watch out for the Big Ben symbol. Sherlock, Dr Watson and Big Ben act as substitute wild cards. Moriarty and the duel symbol are scatter symbols that pay in either direction, however, the duel symbol is only available on reels two, three and four. Where three duel symbols appear on the relevant reels, the duel bonus is triggered and Sherlock and Moriarty engage in a shoot-out to retain or remove prizes that will be offered to you on completion of the duel. You may choose to keep the prize or duel again. Three or more Big Ben symbols will trigger free games. There are additional extras to the game. On achieving winning lines, you are presented with three options displayed on the bottom middle of the screen. The options are to: collect your winnings, take the card gamble or take the ladder gamble. Selecting collect will simply add your winnings for the paylines to your total and allow you to spin again. Choosing to take the card gamble presents you with a view of a pack of cards with one face up. You simply indicate whether you predict the next card to be black or red. This step can be repeated if you are successful up to a maximum of 140, or the currency equivalent, is reached. If you select the ladder gamble you are presented with a ladder indicating multiples of currency doubling at each step. Again, you may continue to press the gamble button to climb the ladder and achieve greater rewards to a maximum of 140. During this additional gameplay, you are presented with the options to collect winnings at any point, or to collect half. If you choose the latter, half of your winnings will be banked before you continue. The game can be played on any mobile and tablet or desktop device, just like the other free slots on our site. It's elementary dear player! 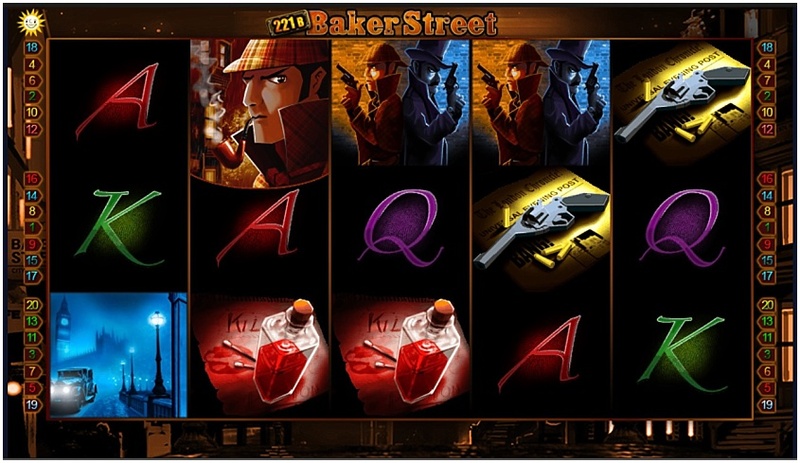 * 221B Baker Street trademark / license is owned by Merkur Gaming. This site is not endorsed by Merkur Gaming.